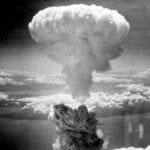 On August 6, 1945, the United States dropped an atomic bomb on Hiroshima, Japan, resulting in 240,000 casualties. This was the first of two of the only nuclear weapons used on civilians in the world’s history. Shirley Shimada’s family is from a fishing village outside of Hiroshima. She shares her family’s stories about how bewildered the Japanese people were with the impact of this new munition. Shimada recounts what her uncle, a trainmaster near Hiroshima, told her about sending his crew in to help the victims. Shimada is the chair of the planning committee for the event “From Hiroshima to Hope“, an event commemorating the bombing of Hiroshima. KBCS’s Yuko Kodama spoke with her at Seattle’s Green Lake Park.